New Westminster, B.C. 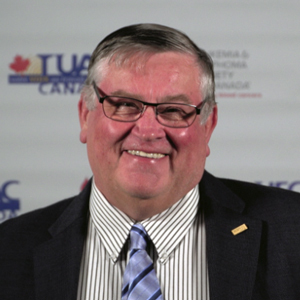 – November 30, 2018 – UFCW Canada Local 1518 President Ivan Limpright is stepping down after 34 years of service to the union. “The opportunity to serve the membership and to lead Local 1518 has been an absolute honour and privilege,” says Limpright. Brother Limpright joined the union in 1975 when he started work in the Overwaitea warehouse. He was elected shop steward in 1984, beginning his career with UFCW 1518. Limpright went on to become chief shop steward, a role in which he successfully negotiated a strong collective agreement when the warehouse was sold to a new owner. “We got a pension plan, very good benefits, and a profit-sharing program (from that contract),” Limpright explains. Brother Limpright was later promoted to Director and again travelled across British Columbia, conducting presentations on the UFCW 1518 Pension Plan. In the fall of 2000, he was elected Secretary-Treasurer of the local. Seven years later, he was elected president of UFCW 1518. “I always tried to improve the lives of members by fighting for good collective agreements and by doing what is best for members and their families,” says Limpright. To read the full version of this story, including an extensive interview with Brother Limpright, and to learn more about UFCW Canada Local 1518, visit the UFCW 1518 website.